A Timely Tribute to Terminally Tranquil From the New England coast to the desert Southwest, hidden truck treasures are pictured resting (and rusting) away in scenic American settings. 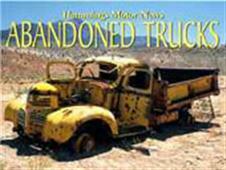 This entertaining book puts a humorous twist on before-and-after with campy new-truck ads from the abandoned trucks' first days on the American scene. Salted with humorous writings.